Who makes the chandelier? Do you know the dimensions? Yes, please!! Where is chandelier from?? What kind of stone is the flooring? Where to purchase, please? 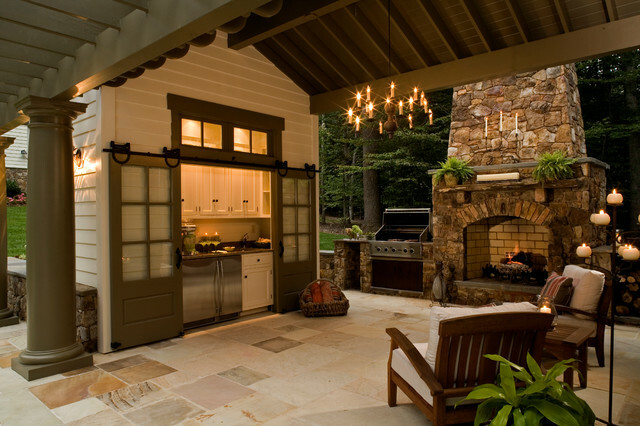 - Love your beautiful outdoor space!!! We are working on ours, but still undecided about what to use for flooring...your feedback would be appreciated. I love the look of it and certainly would like to know what it is! What product ...(name and color) for the ceiling? What did U use for the paito.I want something light like this! What is the name of the stone used for the patio? Where can I purchase it? I live on Oahu, Hawaii. Doors? - Which Simpson door is this? Thanks for your inquiry. The door is the thermal sash #7506 from Simpson. The stone on the fireplace is western Maryland fieldstone. Rill - What company did you source the Maryland fieldstone from? What type of floor is this ? Is it paver or stamped concrete ? Thank you for the inquiry, the flooring is limestone. What does the 2 small buildings contain? - One looks to be a wet bar, is the other just storage? Can the plans be purchased? One is the kitchenette you see in this picture with storage behind it. The other pavilion holds a Powder Room. Unfortunately we do not sell our plans. All our project are custom designed for each client. Thanks for the inquiry. What is the total size of the patio? size of the covered kitchen? Thanks for your interest. The covered porch area is 16x12 and the kitchen building is 8x12. There is a storage area in part of the kitchen structure accessed by doors around to the right. Where do you get the pillars? Thanks for the inquiry. The columns are the Tuscan Stavecast by Somerset Columns. 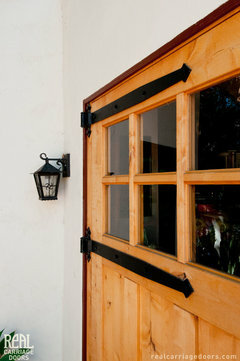 Thanks - The doors are from Simpson Doors and the barn door hardware is from Real Sliding Hardware. What type of fridge is that? What are the approx dimensions of the fireplace? Can we build a FP right off our covered porch like this?